Friday February 1, 2019-Embattled Makueni Governor, Kivutha Kibwana, has rubbished Wiper Leader Kalonzo Musyoka’s consultative meeting at his Yatta farm in Machakos County on Tuesday. Speaking during an interview, Kibwana told Kalonzo point blank that he will never become President of Kenya even with the help of Jubilee Party Vice Chairman, David Murathe. 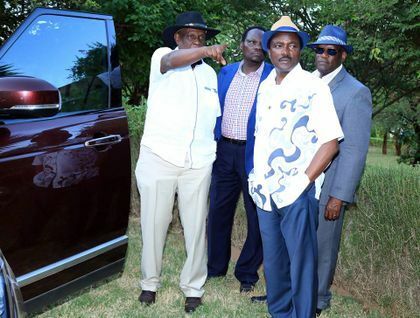 Kalonzo hosted the Annual Ukambani Leaders Consultative Meeting attended by former Jubilee Vice Chairman, David Murathe, among other top politicians and opinion leaders. However, Kibwana said the meeting was meaningless and that it won’t add value to Kalonzo’s 2022 bid. Kibwana termed Kalonzo as an anti-development leader who does not deserve all the honors he has been given and that he does not deserve to be President. “Now we know that Mr Musyoka was squarely behind the 2013/2017 anti-development war in Makueni. This is how he has treated the county that used to support him most in Ukambani,” Kibwana said. Kibwana has since resigned as Wiper Party chairman.